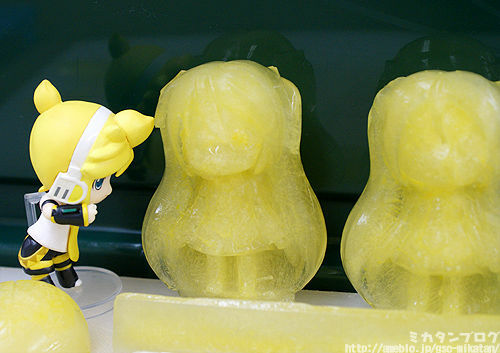 This Nendoroid Comes with…an Ice-Tray! 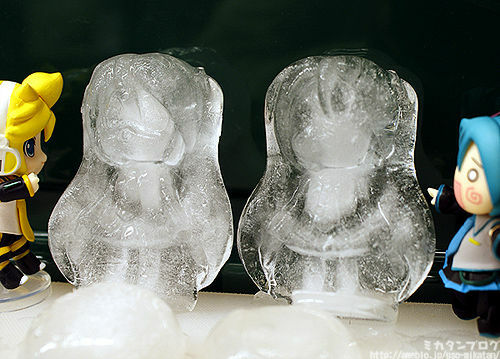 I wonder who’s idea it was to go, “Hey, this Nendoroid is snow-themed…LET’S INCLUDE AN ICE-TRAY!” Well, either way I think it was a great and amusing idea. 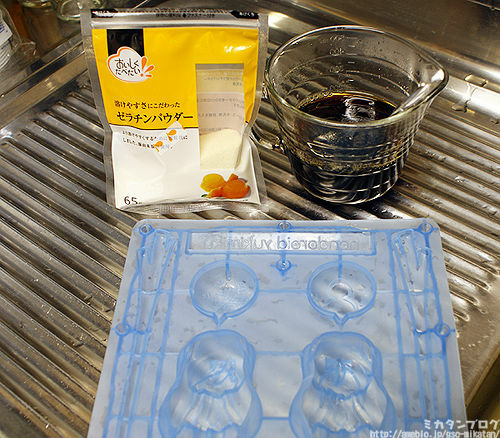 Mikatan’s blog has shown us the many things you can do with this ice-tray! What can you do with an ice-tray, you ask? Follow the jump and see! Which turns into a vague figure of Miku, Mikatan gives some tips on how to improve your Miku-ice-cube making skills. – Before it freezes completely replace the water. – Give it time to freeze completely. Afterwards, they tried some tea. Looks much better huh? The tea seems to make Miku’s facial features a bit more recognizable. 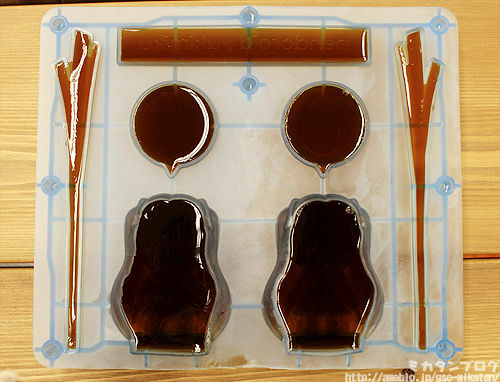 After this coffee gelatin Miku was made. Ingredients include water, gelatin, coffee, and sugar! Ta-da! Wow, right? 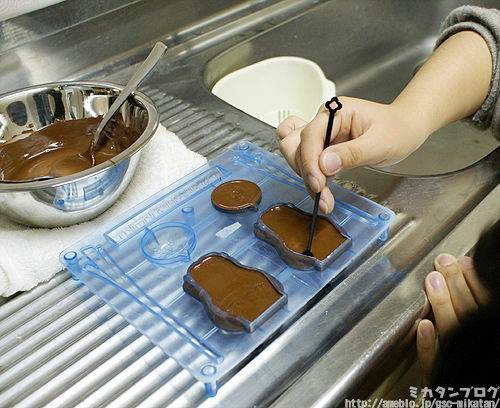 Maybe GSC should have marketed it as a jelly-tray. 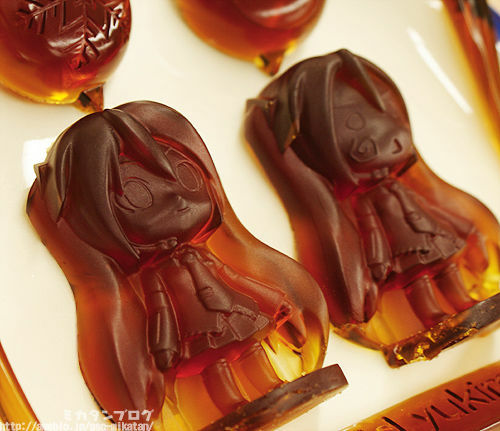 I kind of want to make jello Miku now. Next up is chocolate! 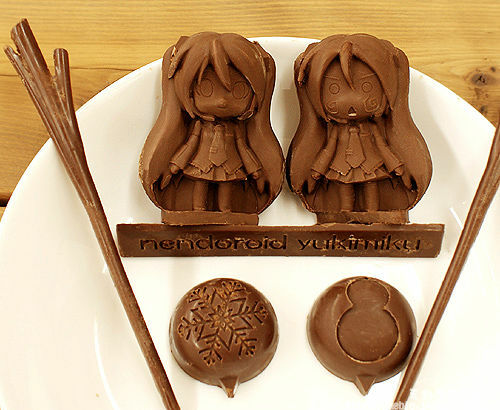 Celebrate the Month of Love with your own Chocolate Miku! Looks nice and detailed, not as nice as the gelatin but still looks delicious! Thanks for staying with me for this upbeat article! If you would like more information about Snow Miku you can visit the GSC page here. I want one of these. I haven't used one in ages. I haven't really had room in my freezer for ages either though. ano^v^ how did you order it via online? I thouht Good Smile cannot ship this out of Japan? OK today is the last day I think so I would hurry but several online sites like YesAsia and a variety of Japanese Proxy Services can order them for you. Maybe past today even but I would look into it soon. 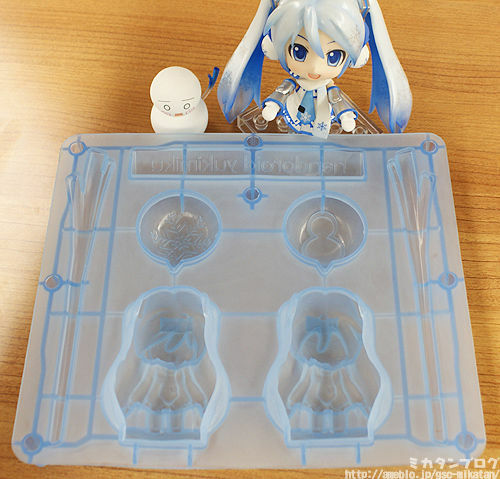 nooo way in hell i will eat something out of those ice tray… because the figures are too damn cute and it will look like i'm eating miku…damn it!! it just too awesome!!! but stilll……. i want it!!! Just make icecubes out of it and watch miku float in your drink! i dont know whose idea this is…. but all I can say is… GENIUS! kagamine? lolz!! i just wanna munch on that chocolate leek!!!! 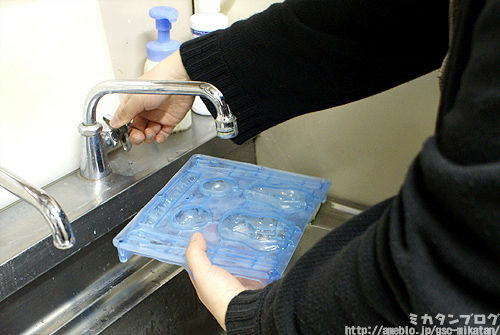 A very educational blog entry for those who are lacking ideas on how to play with the ice-tray.